Our PA10 PA Pro™ is a portable and wireless PA system for indoor and outdoor voice amplification for educators and presenters in schools, on field trips and in tour groups, lecture halls, meetings and at conferences. With its 10 watts of power, it can project audio to an audience of up to 150 people and can be a potential lifesaver in emergencies where crowd control and communication can make the critical difference. Constructed with rugged ABS plastic casing for durability and to withstand repeated use, the PA Pro has a carrying handle, telescoping antenna, and rechargeable built-in battery that can last up to 6 hours. It includes a dedicated hands-free lapel microphone and a lightweight beltpack transmitter with a 100' wireless transmission range to the PA. Both the transmitter and microphone can be stored inside the amplifier's storage compartment to keep the components safe and organized. The speaker has a low battery indicator, separate tone and volume controls and a 3.5mm mic jack for use with a wired microphone. A choice of two VHF frequencies (206.400MHz for PA10A; 210.250MHz for PA10B) makes the PA Pro versatile and allows two systems to be functioning in the same area at the same time without causing any interference between both PA speakers. 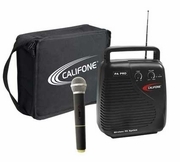 PA Pro packages with your choice of frequency containing one PA speaker, one dedicated handheld wireless microphone (PA10A-M or PA10B-M), and a storage/carry case (C10) are also available (PA10A-1 package or PA10B-1 package).